Next door a feminist makes her bed. Her room adjoins mine, as in dreams the impossible clearly isn’t. She is old and venerable, and I help her with the floral spread. I am a feminist too, only, we shall see, different, because outside a window—whose? Perhaps it doesn’t matter. We are two feminists together for a moment in one poem. I look out at a doe strung up by her hind legs and her fawn, wet, as if they have been hanging in rain. And when I look again, the doe reaches her damp head and licks her fawn. It might have been her last gesture with her last strength. Then I am doing the dangerous thing, running with sharpness—scissors? a knife?—outdoors on uneven ground. I wheel one way and another, but there is no doe, no fawn. I have come to cut them down. But someone has taken them already. I double over on the path, sobbing. It is more like a wail, a keen. The old and venerable feminist tries to shush me. I wave her away. I will grieve for the doe and her fawn. She cannot stop me. I am a feminist too. And somewhere the hunter has his carcass. She and I, we have made our choices. She has chosen the hunter. I have chosen the deer. This poem is based on a dream I had shortly after attending a conference with other feminists who did not share my ecofeminist perspective on the need to make common cause with other animals. It was one of those dreams from which you wake raw with emotion, and I drafted the poem with urgency. In 2007 I had gone through breast cancer treatment, and while in that process I began to identify powerfully with the deer who live around my home. The last animal flesh I ate was from the body of a hunted deer, and I woke that night in terror, understanding the moment of the deer’s death. Since then, other animals have not been food for me, and I have discovered the brilliant work of Carol Adams, Josephine Donovan, Lori Gruen and others. When I read feminist theory in graduate school in the 1980s, I was taught to dismiss ecofeminists as essentialists who simplemindedly assume that women are innately closer to nature and therefore uniquely qualified to address our environmental crises. That was a reductive misrepresentation of ecofeminism that still has currency today; it doesn’t do justice to the complexity of the field nor the ways it has developed as any dynamic perspective does. The poem addresses the blind-spots I still find in feminist thinking that assumes human beings are in the struggle alone. Though the divide in the poem seems generational, of course ecofeminists have been working since the beginning of the contemporary women’s movement in the U.S. in the early 1970s. Perhaps the “old and venerable” feminist represents the painful ways I have had to acknowledge a breach with my own feminist teachers and mentors on this issue. At a very visceral level, the poem names my refusal to marginalize a feminist perspective that has the greatest explanatory and healing message I know. 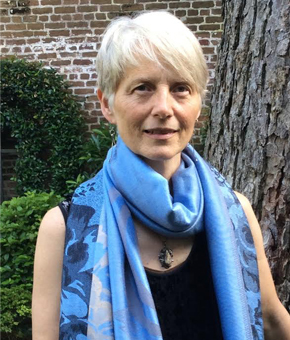 Kathryn Kirkpatrick is a Professor of English at Appalachian State University where she teaches environmental literature, creative writing, and Irish studies. She holds a Ph.D. in Interdisciplinary Studies from Emory University, where she received an Academy of American Poets poetry prize. Her poetry collections include The Body’s Horizon (1996), selected by Alicia Ostriker for the Brockman-Campbell award; Beyond Reason (2004), awarded the Roanoke-Chowan Poetry Prize by the North Carolina Literary and Historical Association; Out of the Garden (2007), a finalist for the Southern Independent Booksellers Association poetry award; Unaccountable Weather (2011); Our Held Animal Breath (2012) selected by Chard DeNiord for the Brockman-Campbell Award; and Her Small Hands Were Not Beautiful (2014), selected by Carolyn Kreiter-Foronda for the Brockman-Campbell Award. Currently, she is the editor of Cold Mountain Review. As a literary scholar in Irish studies and the environmental humanities, she has published essays on class trauma, eco-feminist poetics, and animal studies. She is the editor of Border Crossings: Irish Women Writers and National Identities and co-editor with Borbala Farago of Animals in Irish Literature and Culture (2015).